Russeting is characterized by multiple micro cracks in the tomato skin which are often concentric; also called cuticle cracking. This disorder is caused by fluctuations of soil temperature and soil moisture. This is a physiological disorder – a problem caused by the growing conditions rather than by a pest or disease agent. Inappropriate levels of water ( drought, fluctuations in watering/rain, flooding), light, temperature (stop and start growing) and nutrients can all cause a variety of physiological disorders in tomatoes. The fruits are especially vulnerable as they are at the growing tips and have to compete with the new shoots for water and nutrients. The cuticle, the very outside, transparent layer, of the fruiting skin may become less elastic. As the fruit grow, the cells of the fruiting skin loose their elasticity and small cracks start to appear. Excessive temperature changes during the daytime and nighttime cause the skin of the fruit to react to the air around it. 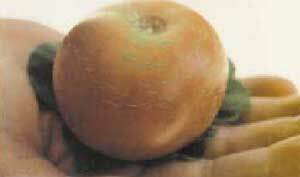 Water condensation within the skin of the fruit may expand and contract causing cracking. Apply adequate mulch in hot weather to keep the soil cool and decrease evaporation. Consider raised bed gardening for better drainage. Use shading material to enhance a cooling effect on the entire. Pick tomato early when fruit shows color. < Previous Okra Loves Heat!!!! Next > Miss Kitty vs Victory! !